A child you care about is grieving. If you, too, loved the person who passed away, you are now faced with the difficult but critical task of helping both yourself and the child heal. Throughout the coming months you will be both a role model and a helper to the bereaved child in your care. One of the first opportunities for you and the child to express your grief is the funeral. This article will help you understand the importance of the funeral not only for you and other adult mourners, but for the children. It will also offer suggestions for guiding children through this important ritual in a healthy, life-affirming way. Help them acknowledge that someone has passed away. Provide a structure to support and assist survivors through their initial period of mourning. Provide a time to honor, remember and celebrate the life of the person who passed away. Unless they have attended one before, children don’t know what to expect from a funeral. You can help by explaining what will happen before, during and after the ceremony. Let the child’s questions and natural curiosity guide the discussion. Give as many specifics as the child seems interested in hearing. For example, you might tell her how the room will look, who will be coming and how long everyone will be there. 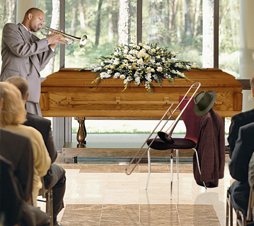 When possible, arrange for the child to visit the funeral home before the funeral. This allows her more freedom to react and talk openly about feelings and concerns. If the body will be viewed either at a visitation or at the funeral itself, let the child know this in advance. Explain what the casket and the body will look like. If the body is to be cremated, explain what cremation means and what will happen to the cremated remains. Be sure the child understands that because the person has passed away, he / she no longer feels pain or anything at all during cremation. Help children anticipate that they will see people expressing a wide variety of emotions at the funeral. They will see tears, straight faces and laughter. If adults are able to openly show feelings, including crying, children will feel much more free to express a sense of loss at their own level. Help the child understand why we have funerals. Children need to know that the funeral is a time of sadness because someone has passed, a time to honor the person who is no longer with us, a time to help comfort and support each other and a time to affirm that life goes on. Children seem easily to embrace is that funerals are a time to say goodbye. Saying goodbye helps us all acknowledge that the person we loved is gone and cannot come back. If the body is to be viewed, tell the child that seeing the body helps people say goodbye and that he may touch the person he loved once last time. Now is also a good time to explain to the child what spiritual significance the funeral has for you and your family. This can be difficult, for even adults have a hard time articulating their beliefs about life and death. One guideline: children have difficulty understanding abstractions, so it is best to use concrete terms when talking about religious concepts. When appropriate, you might invite children not only to attend the funeral but to take part in it. Bereaved children feel like their feelings “matter” when they can share a favorite memory or read a special poem as part of the funeral. Shyer children can participate by lighting a candle or placing something special (a memento or a photo, for example) in the casket. Many children feel more included when they are invited to help plan the funeral service. Children should be encouraged to attend and participate in funerals, but never forced. When they are lovingly guided through the process, however, most children want to attend. Offer the reticent child options: “You can come to the visitation today with everyone else or if you want, I can take just you this morning so you can say goodbye in private”. Being there for the bereaved child-before, during and after the funeral-is the most important thing you can do to help. When we grieve, we all need support from others. Grieving children, especially, need to know they are not alone. Physical closeness and comfort are reassuring to children during times of distress. What you say may not be as important as a touch on the shoulder, a hand on the back or a shoulder to cry on. Remember to be a good observer of children’s behavior. Be patient and available as you allow children to teach you what the funeral is like for them. An anonymous author once wrote, “When words are inadequate, have a ritual”. For children and adults alike, death often leaves us speechless. The funeral, a ritual that has been with us since the beginning of time, is here to help us embrace the life that was lived and support each other as we go forward. As caring adults, we will serve our children well to introduce them to the value of coming together when someone we love passes away.